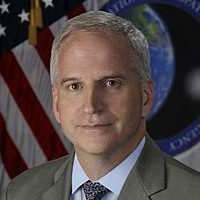 Robert Cardillo has retired as the chief of the National Geospatial-Intelligence Agency. NGA is the most obscure $5 billion a year organization that you never heard and the departing Cardillo has a knack for avoiding the news. Cardillo, almost alone among the U.S. intelligence chiefs who testified on Capitol HIll this week, did not contradict President Trump on any major intelligence issue. That may be because Trump (like the rest of us) has only the dimmest idea of what NGA does. But NGA matters. In the Washington power schema, three letter agencies (eg. CIA, EPA, FBI) carry the most clout. So when the agency was created, the canny bureaucrat hyphenated Geospatial and Intelligence. Voila! The agency somehow became stronger. This is how Washington works. So NGA has clout in inter-agency deliberations. And any government agency with a $5 billion a year budget has substantial hiring and contracting powers. Dan Coats, Director of National Intelligence had this to say about Cardillo and his agency. He held senior positions in U.S. intelligence across two consecutive administrations and focused NGA on exactly what it needs to do—know the earth, show the way, and understand the world. President Trump meets with CIA director Gina Haspel and ODNI director Dan Coats in the Oval Office, February 2019.